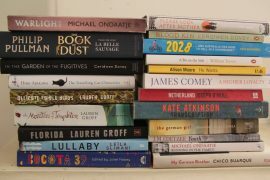 Availability and a grab-you-by-the-lapels first few pages has proved a crude but effective way into the twelve books vying on the Man Booker long list. The Unlikely Pilgrimage of Harold Fry by Rachel Joyce is her debut novel. Harold is retired, living with his wife Maureen. His son, David, long estranged, does not talk to him. Each day is painfully, monotonously, ordinary. One day he receives an unexpected letter from Queenie, a long-ago acquaintance now in a hospice dying from cancer. On the spur of the moment he decides to walk and say goodbye in person to Queenie, convinced that his journey is keeping her alive. He sleeps in the open, eats what he can afford from the meagre amount he took with him or scrounge from people on the way, growing daily in confidence and personal satisfaction. He attracts a motley collection of fellow pilgrims of varying morals and motive and becomes a national curiosity. But it is only when he is alone again at the climax of his journey, that the shards of understanding he has been gathering along the way can be finally pieced together. Although Joyce does occasionally over-sugar the story, overall it’s a rewarding book about the isolating emptiness of loss and the possibilities of starting over. I fear the very genteelness of Joyce’s book, her debut, will see it pushed from the short list by its more strident fellows. We shall see in September. Hi – I just finished reading this; I could hardly put it down, unexpectedly moving and enthralling in equal measure.